Brisbane’s premier trainer Tony Gollan is confindent that Ef Troop has had the perfect preparation in the lead up to Saturday’s $2m Magic Millions 2yo Classic (1200m) at the Gold Coast. Jockey Jim Byrne, above, will ride Outback Barbie in the 2018 Magic Millions 2yo Classic at the Gold Coast. Photo by Daniel Costello. Gollan has timed Ef Troop’s preparation so the youngster will be peaking on race day and has brushed aside any disappointment of drawing a wide barrier. Ef Troop came up with barrier eighteen in the original draw of sixteen final acceptors plus five emergencies but will jump from gate thirteen if all of the reserves fail to gain start. The Spirit Of Boom juvenile has led at his only two starts for two wins at Doomben in a 1050m two year old Handicap on November 4 and in the Listed $100,000 Phelan Ready Stakes (1110m) on December 16 and Gollan expects him to go forward again from the wide gate. 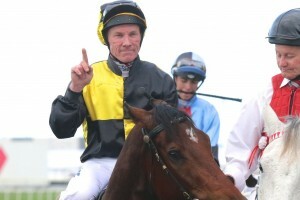 “It (the draw) takes a bit of thinking out of the equation, he’ll just be out there to get into his stride and whatever happens underneath him will tell where he ends up in the run,” Gollan racing.com. “Everything has gone perfect with him to date, hopefully there’s no fly in the ointment in the next couple of days. Ef Troop is one of the top fancies for the Magic Millions 2yo Classic, sharing the second line of betting with Jonker at $4.80 with Ladbrokes.com.au while Gollan’s other runner Outback Barbie is rated as a $20 chance. The Tony McEvoy trained Sunlight remains the $4 favourite on race eve. Outback Barbie has only had one race start for a win in the Listed $100,000 Calaway Gal Stakes (1110m) at Doomben on December 16 but Gollan is not worried that the Spirit Of Boom filly hasn’t race for a month. “We’ve only seen my filly once but I can guarantee that she’s improved a hell of a lot,” Gollan said. Jim Byrne takes the ride again on Outback Barbie after steering her to victory at Doomben and the filly has drawn nicely at barrier six which Gollan said will suit her racing style. “It was really important that she drew a gate, she’s got good speed and if she can relax nicely she’s got a good turn of foot,” Gollan said.